Hoa Binh is 75 km far from center of Ha Noi, is the gateway of economical area between North-West provinces and Red River Delta. Although Hoa Binh’s geographical characteristics make it difficult to develope infrastructure but the mountainous topography here is really a Godsend in term of tourist attraction. Together with average-high mountains are green valleys; surrounded by primitive forests and streams that offer tourists numbers of tours like adventurous hiking, walking, hunting or hot spring. Hoa Binh will become a major eco-tourism center in the region soon. 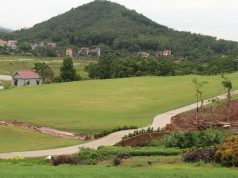 Phoenix Golf Resort is located in Yongbong Village (ground configuration of image of dragon and phoenix being seated together) and is 40 km away from Hanoi. Officially opend 36 holes in November 2006, nowadays, with total 54 holes (03 courses). Phoenix Golf Resort is the biggest golf resort in Vietnam and second biggest in Asia. 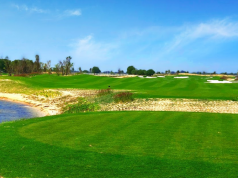 Phoenix Golf Resort located in the ideal location for stunning Vietnamese mountain countryside and is surrounded by spectacular limestone karst scenery nicknamed the Halong Bay of land. The 54-hole is divided into 3 18-hole courses: Phoenix, Dragon and Championship. The Championship where 1st Masters Pro Championship was held is a links-style golf course, while the other two perform in a more dramatic scenic mountain design. The 3 courses all creates use of serious fairway and natural undulations as well as brilliant redirecting through and around the unique-looking limestone cliffs. With a choice of 5 different tee positions, the course is appealing to all levels. Three different 18-hole courses are designed by international professionals. Phoenix course was planned by golf course architect Ronald W. Fream (Golf Plan, USA) who has been providing golf course design and architectural services for 30 years in more than 75 countries and constructed by two shapers Calvin Sylva(USA) and Ron Leck who is one of the able pupils of Jack Nicklaus. Dragon course was developed by Lee Dae-bong who is recognized as the best talented golf course shaper in Japan with experiences over 20 Asian reputed golf courses. Champion Course was constructed by Korea’s best course architect Lee Hee-cheol who has designed many renowned golf courses in Korea. Designers of this giant course put a lot of effort to protect nature and environment so the golf resort has the majestic view and boasts itself as “one of the most beautiful golf courses in the world”. 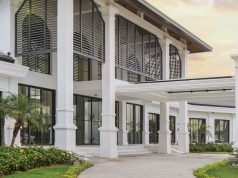 Set among the dramatic countryside and karst formations of the area, this golf resort has its amenities a driving range; a large European-designed club house; a five-star condominium-hotel with 200 rooms; a large restaurant; conference facilities and an indoor/outdoor swimming pool. Although it only takes 1 hour drive from Hanoi, Phoenix Golf Resort will make you feel as if you’re a totally different world. Address: Lam Son commune, Luong Son district, Hoa Binh province, Vietnam.